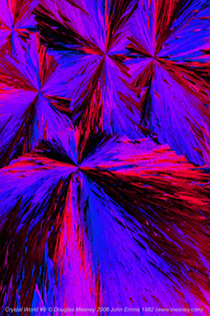 The Crystal World Collection presents close-ups of crystals formed by common substances. The Crystal World Collection is collaboration with John Emms. 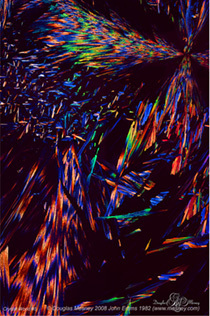 then further "enhanced" to create these crystalline vistas of rainbow colors. The combination of macro photography and digital enhancement produces impressionistic views into other worlds. 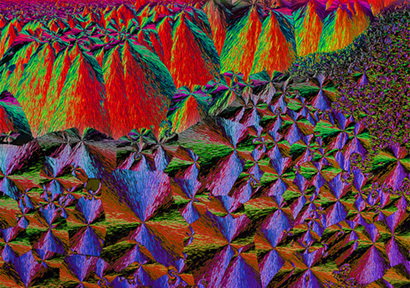 The microscopic crystal fractals build miniature landscapes. In some you may feel as though you are peering at a mountain range or deep into the sea. Others might be the somewhere in space or on another planet. The enigma is enhanced as you consider that they are pictures of real things. The Crystal World Collection presents a favorite theme: "worlds within worlds." It is the all-is-one Nature of things, as symbolized by Yin and Yang. Click here to view the full Crystal World Collection catalog. Click here for a trifold brochure of a partial Crystal World Collection.